Sift flour & Du Chocolat into a bowl. In a separate bowl, whisk to combine the eggs, milk and oil. Slowly pour the milk mixture over the flour, gradually whisking until smooth. Cover and stand in the refrigerator for 30 minutes. Heat a medium fry pan over medium-low heat, coat with a generous amount of butter. When the butter starts to bubbles evenly over the pan, ladle in some of the batter, rotating the pan to coat the base and a little up the sides. Cook the crepe for 2-3 minutes, until the shiny top disappears and the edges start to darken and become crispy. Gently flip over and cook for another 30 seconds – 1 minute. Repeat with the remaining batter. Make the chocolate sauce by heating the cream in a saucepan over medium-low heat. Whisk in the Du Chocolat and chocolate chips until dissolved and the mixture starts to bubble. Remove from the heat and stand for 5 minutes. 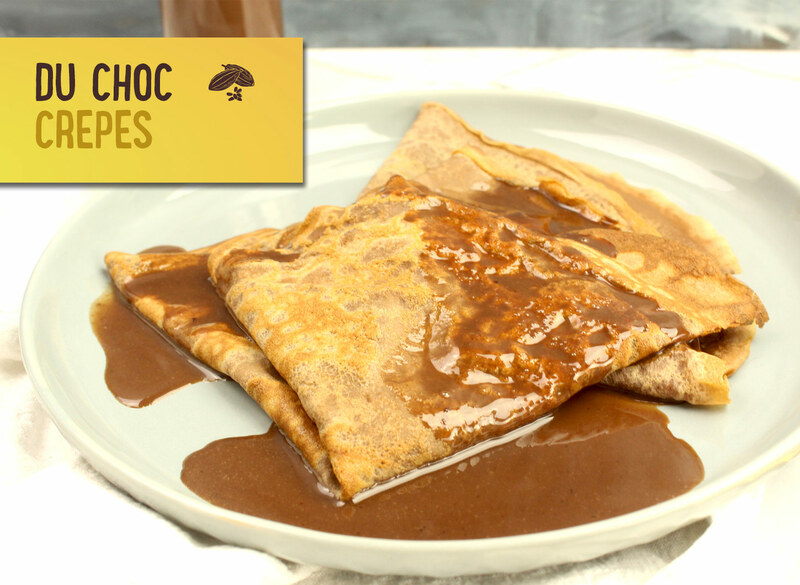 Serve the crepes with the chocolate sauce drizzled over the top.